Last season eventual D-II national champion Nova Southeastern started the season 0-3 and had a pedestrian 11-10 overall record as last as mid March. D-III’s Trinity started the year an unremarkable 2-2 before taking home that Division’s title at season’s end. As such, it’s unwise to put too much focus or emphasis on early results. While they can be indicators of overall aptitude, unless something truly remarkable for better or worse is happening on the diamond, the results don’t have a whole lot of weight attributed to them. As such, there isn’t a lot of movement in the first rankings update of 2017. There has been some minor shuffling and arranging of teams, but the best action is yet to come. Rankings are based on games through Sunday, Feb. 19. The first weeks of the season were not kind to the teams in the Top 25. None escaped the first 10 days of the season unscathed and most clubs were dealt multiple defeats. The uncharacteristic losses made repositioning teams an arduous task. Schools which ordinarily would have moved down a peg or two on the top teams’ table instead remained in their spots, and sometimes even moved up, because other clubs around them had even worse outcomes than themselves on the diamond. For example, Colorado Mesa was impressive out of the gate, taking three of four on the road against Dixie State. However, the Mavs went home and could only manage a split with Montana State Billings the next weekend. The Yellowjackets are a fair opponent, but one which shouldn’t be bullying a team the likes of CMU on its home turf. Nevertheless, the losses paralleled results across the nation so the Mavs’ defeats were inconsequential to their position in the top 10. In fact, they moved up a smidge as discouraging starts were turned in by other neighboring teams. The best matchup of the early season was held in week two when previously 11th ranked North Georgia hosted the reigning national champion and ranking’s salutatorian Nova Southeastern. The Nighthawks and Sharks treated spectators to three tightly contested contests in which the outcome in each was in question until the final out. 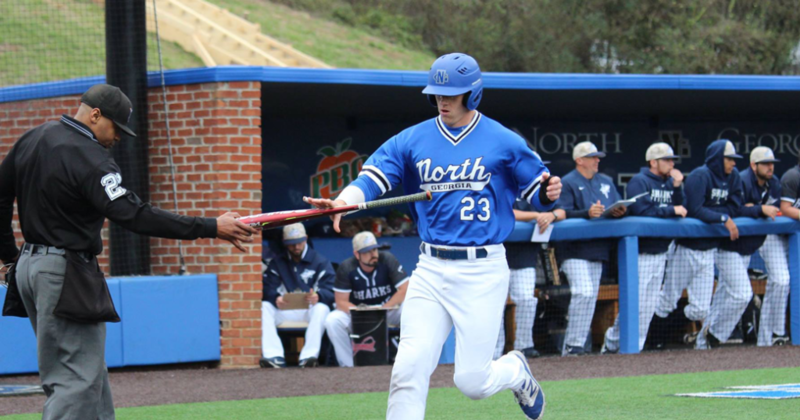 With the 2-1 series win, UNG entered the top 10, a position they nearly were bestowed in the preseason. In early drafts of the preseason rankings North Georgia was penciled into a single digit ranking based on their pitching and defense; their offense, while experienced, was worried to be a little underwhelming. That assessment seems to be unwarranted as they’re hitting .317 as a team and already have 17 home runs in just 10 games. The battle for the top of the Peach Belt standings, between the Nighthawks, USC Aiken and ranking’s neophyte Flagler, who enter at 22, should be a barn burner. A team to be very worried about is Angelo State. The Rams’ 2017 prospects were a bit enigmatic as a number of the pivotal players from last year’s CWS team had graduated. The question was whether the Rams were going to rebuild or reload. After an 8-1 start with a sweep of Lubbock Christian last weekend, it appears the answer to that is going to be the latter. Jacob Boston, a recruit from Mesa Community College, has blistered the ball out of the gate, with 15 hits in his first 37 at-bats, seven of which were for extra bases. If this team is that good this early, they could be downright deadly at the end of the season. Although Lincoln Memorial started the season 3-8, don’t count the Railsplitters out for a dark horse run deep into the postseason just yet. LMU suffered seven of those losses to high caliber teams, including USC Aiken, Florida Tech and Top 25 outlier Lee. They’ve dropped out this week, but they’re candidates to be back sooner than later. Dropped out: St. Mary’s (17), Augustana (22), Lincoln Memorial (25). Keiser’s four losses are negated by their dozen wins, which includes series wins over highly ranked Northwestern Ohio and St. Thomas, to remain atop the NAIA rankings. The Seahawks early season schedule also includes a win over Georgia Gwinnett to demonstrate KU’s capability for success. Impressively, the Seahawks have been frighteningly formidable without much production from two-time All American Keivan Berges who has only played in half of KU’s games. Instead, KU has dominated on the mound with the trio of Miguel Castellanos, Daniel Garmendia and Kyle Keatts earning eight wins while amassing 86 strikeouts in only 76 1/3 innings with only 52 hits allowed and 16 walks. Time must be taken to recognize the turnaround which has taken place at Southeastern. The Fire spent the last couple of seasons in the perpetual “receiving votes” portion of the rankings, but have been obliterating the opposition so far this young season. The Fire have outscored opposition 150 to 47, a measure usually afforded to only video games scores and Harlem Globetrotter results. Luis Diaz has been filthy awesome, tallying a .508 average with seven doubles, six triples and three home runs in 65 at-bats. While it hasn’t been a murderer’s row of opposition, SEU’s wins do include a road sweep over a strong USC Beaufort club so they’re not simply fatting up on cupcakes. Its not improbable to see the Fire remaining undefeated until March 6 when they’ll play second-ranked Bellevue. Entering the rankings in a bit of a surprise are the Sterling Warriors. The Warriors lost their head coach and some of their best players to the aforementioned Southeastern Fire team over the summer. Admittedly they had been relegated to “not this year” stack when positioning teams over the winter in preparation for the upcoming season. However the Warriors have one of NAIA’s best records with an 11-1 mark in their first dozen fixtures. They started the season with a four-game sweep of previously 14th-ranked Wayland Baptist and the wins have kept on coming. Upcoming contests against Science and Arts of Oklahoma and Oklahoma Wesleyan will show if SC’s hot start is beginner’s luck or the sign of something special in Sterling. With 11 of the schools in the top 25 having yet to take to the diamond, there hasn’t been an abundance of results to draw from in order to shake-up the D-III rankings. Nevertheless, there have been some games and series of note, primarily at the top of the rankings. Over the past weekend top-ranked Cortland State earned a pair of road wins over 21st-positioned Salisbury. The decisions were solid victories for the Dragons which should give them an extra morale boost with upcoming games against the rated ilk of Susquehanna, Randolph-Macon and Frostburg State. On top of those challenging contests, Cortland also matches up soon with not-too-shabby Christopher Newport and Johns Hopkins teams. With games like these on the early agenda, by early March it should be well established if the Dragons are deserving of the top team designation which has been unanimously appointed to them. This past Sunday there was a showdown of top 10 teams when seventh-ranked Shenandoah hosted eighth-ranked La Roche. The two games were decided by three runs. While the Hornets swept the abbreviated series, the losses didn’t hamper the Redhawks position in the slightest and only demonstrated that both schools are worthy of their top tier ranking. A noteworthy addition to the top 25 is the Kean Cougars. The NJAC stalwarts had been a perennial national power over the last decade, reaching the World Series six of seven years between 2007 and 2013. Their postseason journeys have stalled in the regionals the past three seasons however with little threat of a deep run. Albeit the season is early, their undefeated start could be the beginning of another championship run. Dropped out: Texas Lutheran (20), Rhodes (23).